Romance the season with this Diakeito design worked in Diacosta with a bottom lace stitch pattern. To fit Misses’ size Small. *Back length: 21 1/4 in. *6, 40 gm/?? yd balls of Dancing Fiber Diacosta by Diakeito Yarn Co.
*Set of double-pointed needles in size 3U.S. 6 1/4 sts and 6 rows = 1 in. with Dancing Fiber DIACOSTA and larger ndls for body pat. 6 1/4 sts and 7 1/2 rows = 1 in. 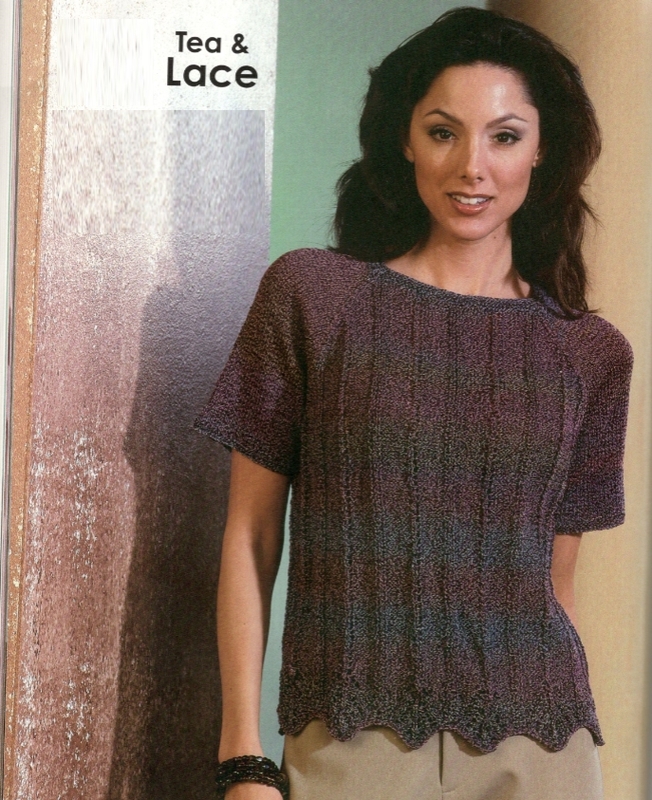 with Dancing Fibers DIACOSTA and larger ndls for bottom lace pat. 5 sts and 81/2 rows = 1 in. with Dancing Fiber DIACOSTA and larger ndls in St st. TO SAVE TIME, TAKE TIME TO CHECK GAUGE. Skp = SI 1 st knitwise, knit 1 st, pass sl st over. Spp = SI 1 st purlwise, purl 1 st, pass sl st over. S2kp = SI 2 sts tog knitwise, knit 1 st, pass 2 sl sts over. Row 1 (WS): P across. Row 2 (RS): K 1, *p 1, yo, k 2, yo, skp, k1,	yo, skp, k 1, s2kp, k 1, k2tog, yo, k 1, k2tog, yo, k 2, yo; rep from * 5 times, end p 1, k1. Row 3: P 1, k 1, *p 19, k 1; rep from * 5 times, end pl. Row 4: K 1, *p 1, k 1, yo, k 2, yo, skp, k 1, yo, skp, s2kp, k2tog, yo, k 1, k2tog, yo, k 2, yo, k 1; rep from * 5 times, end p 1, k 1. Row 6: K 1, *p 1, k 1, p 1, yo, k 2, yo, skp, skp, yo, s2kp, yo, k2tog, k2tog, yo, k 2, yo, p 1, k 1; rep from * 5 times, end p 1, k 1. Row 7: P 1, k 1, *p 1, k 1, p 15, k 1, p 1, k 1; rep from * 5 times, end p 1. Row 8: K 1, *p 1, k 1, p 2, yo, k 2, yo, skp, k 1, s2kp, k 1, k2tog, yo, k 2, yo, p2, K 1; rep from * 5 times, end p 1, k 1. Row 9: P 1, k 1, *p 1, k2, p 13, k 2, p 1, k 1; rep from * 5 times, end p 1. Row 10: K 1, *p 1, k 1, p 3, yo, k 2, yo, skp, s2kp, k2tog, yo, k 2, yo, p 3, k 1; rep from * 5 times, end p 1, k 1. Row 11: P 1, k 1, *p 1, кЗ, p 11, k 3, p 1, k 1; rep from * 5 times, end p 1. Row 12: K 1, *p 1, k 1, p 4, yo, k 2, yo, s2kp, yo, K2tog, k 1 yo, p 4, k 1; rep from * 5 times, end p 1, k 1. Row 13: P 1, k 1, *p 1, k 4, p 9, k 4, p 1, k 1; rep from * 5 times, end p 1. Row 14: K 1, *p 1, k 1, p 5, yo, k 2, s2kp, k 2, yo, p 5, k 1; rep from * 5 times, end p 1, k 1. Row 15: P 1, k 1, *p 1, k 5, p 7, k 5, p 1, k 1; rep from * 5 times, end p 1. Row 16: K 1, *p 1, k 1, p 6, yo, k 1, s2kp, k 1, yo, p 6, k 1: rep from * 5 times, end p 1, k 1. Row 17: P 1, k 1 *p 1, k 6, p 5, k 6, p 1, k 1; rep from * 5 times, end p 1. Row 18: K 1, *p 1, k 1, p 7, yo, s2kp, yo, p 7, k 1: rep from * 5 times, end p 1, k 1. Row 19: P 1, k 1, *p 1, k7, p 3, k 7, p 1, k 1; rep from * 5 times, end p 1. BACK: With larger ndls, CO 123 sts. Row 1 (WS): P 1, k 121, p 1. Rows 2-17: Beg with Row 2, work Bottom Lace St Pat, ending with Row 17. Rows 18-87: Beg Body Pat, rep Rows 18 & 19 until 87 rows have been worked. Raglan Shaping: Maintaining Body Pat, BO 6 sts at beg of next 2 rows. Note: Work raglan decs as toll: On RH side of piece, k 1, k2tog (RS) or p 1, p2tog (WS); on LFH side of the piece, skp, k 1 (RS) or spp, p 1. *Dec 1 st each side every row once, then EOR twice; rep from * 12 times in all. Dec 1 st each side every row 4 times. Work 2 rows straight. BO rem 31 sts. FRONT: With larger ndls, CO 123 sts. Row 1 (WS): P 1, k 121, p 1. Rows 2-17: Work Bottom Lace St Pat as for Back, ending with Row 17. *dec 1 st each side every row once, then EOR twice; rep from * 10 times in all. BO rem 51 sts. 62 sts. Knit 4 rows (garter st). Beg shaping: Inc 1 st each side every 3 rows once, then 1 st every 4 rows 3 times, then 1 st EOR 6 times. Knit 3 rows even. Shape Cap: Note: Work both raglan decs and neckline shaping at the same time as foil: BO 5 sts on each side and at the same time beg decs on the same row as foil: k 2, k2tog on RH side of Sleeve, and skp, k 2 on LH side of Sleeve. Dec for front of Sleeve: Dec 1 st every row once, *dec 1 st EOR 4 times, then 1 st every 4 rows once; rep from * 4 times in all; AT THE SAME TIME, dec for back of Sleeve: dec 1 st row once, *dec 1 st every EOR 4 times, then every 4 rows once: rep from * 6 times in all. Work 3 rows straight. When raglan shaping is completed, beg neck shaping as foil: Short row dec 4 sts EOR 3 times, then dec 1 st EOR once, then 1 st every 6 rows once. Work 3 rows straight. BO. Sew Front to Sleeves. Sew Back to sleeves. Neckband: With RS facing, using dpn’s, PU 50 sts along Front neck, 11 sts along left neck edge, 30 sts along Back neck edge and 11 sts along right neck edge — 102 sts. Join and work around in garter st (k 1 rnd, p 1 rnd) for 7 rnds dec 1 st each side of each corner EOR with first set of decs on Rnd 2. BO.